Junior Tayari Goodwin, and seniors Amya Gumbs, Ericka Alexander, Henok Moges, Chanice Essex-Clark, Wesley Lane, Kelsey Warren, and graduate Alonzo Powell pose for pictures. This is the seniors last dance as a student of Parkway North. On May 5, 2018, Parkway North seniors, juniors, and even some sophomores and freshman, prepared for one of the biggest events of high school: prom. Prom is a time for friends to get together, take pictures, and enjoy a night out away from the responsibilities of school. “It’s way more fun just with a group of friends. It’s more romantic with your date,” said sophomore Gabriel Hogan. The favorite parts of the night included dancing and hanging out with friends. Although most students came with their own group of friends, having fun was not limited to just those few people. “On the dance floor after dinner, everyone was screaming all the words to a song. It was like no matter who you were next to or who you knew, everyone was just having fun,” said sophomore Brooke Williams. Students purchased tickets costing $65, and most students spent around $200 on tuxedos, dresses, shoes, and makeup. Despite the how expensive prom can be, many students say it was worth it. “Everyone looked really nice,” said junior Alyssa Chapman. 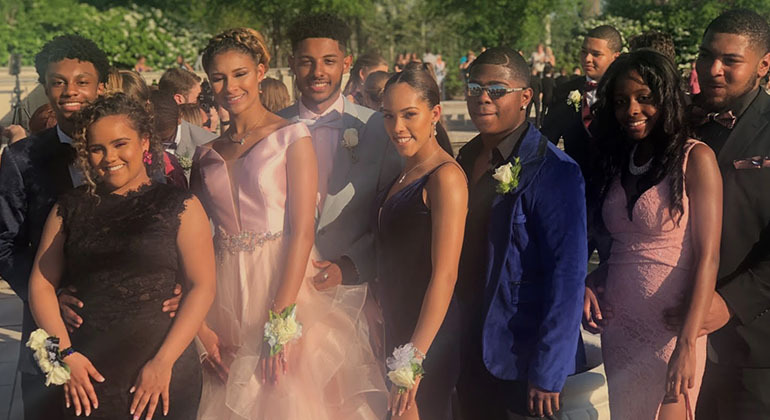 Groups of students met before prom to take photos to commemorate one of their last school events together. Popular places for pictures were the Chesterfield Amphitheater, Westport Plaza, Creve Coeur Lake Park, Queens Park, and the Faust Park. Even though the experience was worth the money, students still believe it could’ve been better. Overall, the night was one to remember with many fun memories made. “It was fun to laugh with friends,” said junior Kristin Sheffer. To end the night, many students went to prom after parties.